Governor Rick Perry will be joined today by a Navy SEAL he helped. 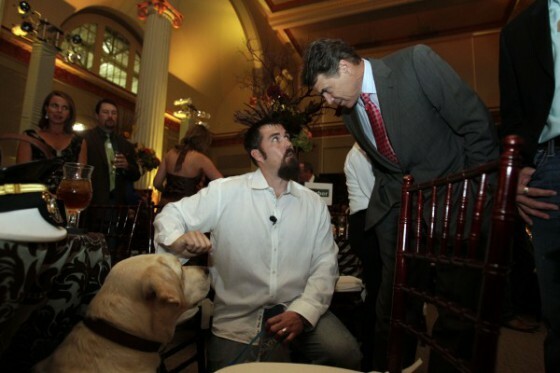 Navy Cross winner former Navy SEAL Marcus Luttrell will join Perry. Luttrell lived with the Perry family for two years. As Texas Governor Rick Perry makes his final pre-caucus appearances before Iowa voters today, he will be joined on the stump by a figure who’s well-known locally: 1996 and 2000 presidential candidate Steve Forbes. The famous flat-tax advocate is expected to attest to Perry’s outside-the-box, anti-Washington campaign message. But also joining Perry will be someone who once preferred to live in the shadows: former Navy SEAL Marcus Luttrell. Luttrell later wrote about the experience in his book, “The Lone Survivor.” It is being made into a Peter Berg movie due for release next year. Unlike Forbes, Luttrell isn’t expected to testify today to Perry’s policy. Rather, he will speak to the Republican presidential candidate’s character. ……Perry told the reporters that after his initial meeting with Luttrell in California, the two reconnected in Texas as the SEAL battled post-traumatic stress disorder and struggled to get off a morphine regimen. Luttrell’s bed was nothing more than an air mattress, the governor related. Perry said he also intervened with Navy Secretary Ray Mabus to get Luttrell the medical and psychological treatment he needed. He ended up being a regular presence in the home for about two years. Also in 2010, he got married. And this past May, Luttrell and his wife, Melanie, had a son.